I first discovered these little palm planes at a Talking Tools event in March 2011 as prototype resin models. Anyone who is serious about using hand tools will naturally have a keen interest in their development and that's what captured my attention. and double convex. Each has a 1.5mm thick A2 blade with a 30° bevel. 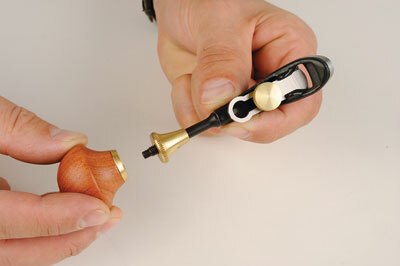 Blade protrusion is hand-fed and locked off with a brass screw set into the investment-cast steel body. The bed is ground to 45° and flat enough to offer a firm seat for the blade. 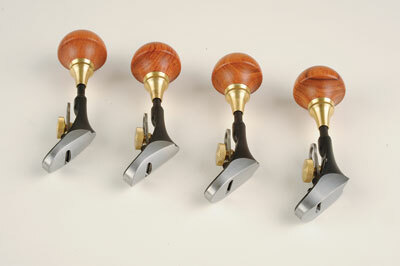 Make no mistake, these are precision instruments and the craftsmanship extends to the bubinga handle that is adjustable in length to suit hands large and small. My first impression was that the long stem would distance the amount of control required for delicate work, but this is not the case. The geometry is perfect and all the necessary force is channelled directly through the tool allowing complete control without juddering. I treated the flat blade to a few gentle strokes across some lapping films before using and was really quite happy with the results. The shaped blades present you with more of a challenge to sharpen but the steel will hold a good edge for a long time. So that just leaves us to decide where and when they might come in handy. Luthiers will obviously find a use and so will restorers, but the versatile nature of curved planes opens up some really creative possibilities. The tiny footprint also allows you to get into some very tight areas. I had not envisaged them being used on site but found they came in handy to shape up repairs on a new section of handrail. Like a lot of specialist tools they have the potential to do a lot more if given the opportunity. 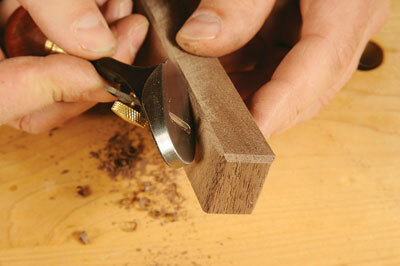 The concave plane will add a roundover to an edge in less time than a block plane would, for example.